So rarely does a film say so much, so genuinely, through simple, naturalistic dialogue about its characters, their plights and their story. And so rarely is it told so beautifully, so painfully and so honestly without being manipulative or obvious. 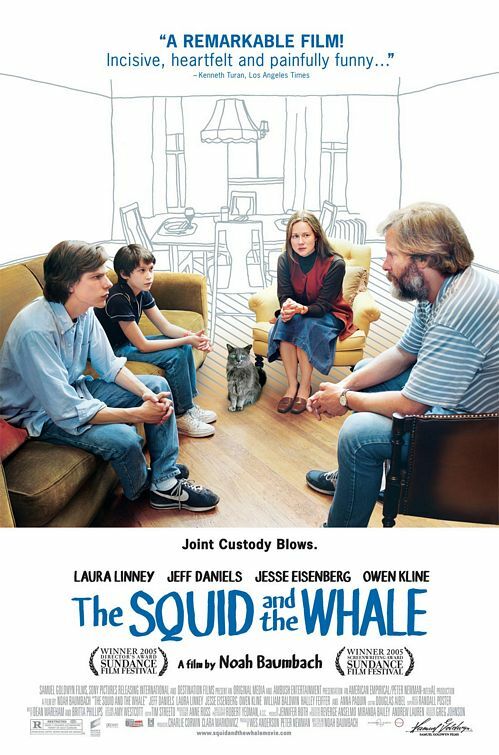 Noah Baumbach’s THE SQUID AND THE WHALE is that unique exception, that kind of film that you walk away from feeling fortunate for having seen it. This is a film about relationships, ranging from the influences our most intimate relationships have on us to the lengths we will go to maintain these relationships, and the difficulties experienced when trying to establish new ones with ourselves. The setting for this exploration is the newly broken home of the Berkman family in 1980’s Brooklyn. We know from the moment we see the Berkman’s as they play a doubles tennis game with passive-aggressive unrest, that they’re all playing a losing game. Bernard and Joan Berkman (played by Jeff Daniels and Laura Linney) have been together for nearly fifteen years and have had two children during the course of their marriage, Frank and Walt, both in different stages of adolescence. As their relationship is at the point of its dissolution, the focus is placed on the children’s struggle to contextualize and understand their new joint custody lives. Bernard and Joan are left to discover a more significant relationship with themselves, a concept that had long since disappeared when their marital problems began to monopolize their attentions. As Bernard Berkman, Daniels is superbly understated. As a once-acclaimed author whose successful past work has stumped him from producing anything new or of worth, Bernard is entirely baffled as to why he has found himself excommunicated from his home and living in a beat up house on the other side of the park. Daniels carries himself with pride and pompousness and never allows any hint of remorse or reevaluation to show in his eyes. The rousing performance is both brave and fresh; I felt as if I had seen a whole new dynamic to Daniels’ abilities. Bernard’s arrogance becomes all the more sad and contemptible when his eldest son, Walt (Jesse Eisenberg) is seen emulating his father’s ideals on topics as diverse as literature and women. Like his father, Walt only appreciates high art, carelessly dismissing anything that his father does not deem worthy, despite having no formal knowledge of the art he praises. His opinions become hollow regurgitations that serve only to give himself the appearance of being more cultured than he truly is. He knows very much about very little. And like his father, he believes himself to be far more important than he truly is, causing him to view his relationships with women to be interchangeable depending on what opportunity presents itself and to see a woman’s purpose to be solely for serving his own needs. Walt’s relationship with his mother, Joan is almost entirely severed after the separation. The blame needs to be placed somewhere and as it was Mom’s decision, this seems to be the best place to put it. Besides, what could possibly make her think she would know what’s better for their family than Bernard would? Joan’s presence is sparse and selfish, leaving Linney’s talents underused. Baumbach, pulling double duty as screenwriter, practically writes her character out of the story. Her career as an author is emerging and her sexuality and self-discovery burgeoning. Her character is more relevant as absent, leaving the men to fend for themselves for some much deserved me-time. This absence has the most impact on their youngest son, Frank (Owen Kline), who is just entering his teens. With Walt constantly feeding his father’s ego, Frank is almost useless to Bernard, leaving him to his own devices. With little supervision or guidance, Frank feels his way through most situations, often making decisions that alienate him from society, making him reclusive and withdrawn, while all the while naively participating in increasingly more destructive behaviour. It is too easy to dismiss Frank as a lost cause in response to his behaviour, as he is the only character who does not fear the future, despite not necessarily understanding all of it. Baumbach’s quiet masterpiece is the filet of the broken family genre. By demonstrating the effects of parents’ struggling to remain involved and not forgotten, as well as reasonably putting themselves before their children, Baumbach shows how the Berkman’s selfishness leads directly to the childrens’ scrambling to regain their balance. That their selfishness is both warranted and understandable is what leads THE SQUID AND THE WHALE to be the most levelheaded and pertinent film dealing with divorce I’ve ever seen. How many sheep would you give The Squid and the Whale?